This looks "good" even at this stage. When I first went in there I cleaned out lots of wood planks, carpet pieces and even rat carcasses... gross. 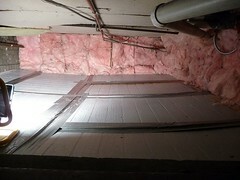 This is after I removed the falling apart insulation from the wood outer walls. 2 walls are wood which we had a rat wall poured and had it bricked in many years ago. The other walls are brick and the floor is dirt. 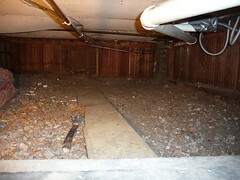 You can see the new insulation to the 2 exterior walls of the crawl space under the kitchen. Over the dirt floor is 6mil plastic then insulation then plywood was laid as a top layer to make a stable surface to crawl in the future. The plywood edges have been duct taped to prevent pinching as the plywood does move due to the insulation under it. I did stuff some insulation up into 2 large holes that were made for a cast iron pipe (no longer being used, but too darn heavy to remove). I didn't do anything with the ceiling tiles that are up there now since I'm guessing they are asbestos.